There's competition to get a spot in central London which keeps the standard quite high. Good energy pays. Frenetic loud sounds get short shrift with the locals who are trying to work and local council Environmental Health & Pollution will banish "noisy" mindless punk. (noisy and high energy are not synonymous!). Endless repetition is also unpopular so to be accepted they have a reasonable repertoire. Buskers make more if they have someone else to pass the hat and a CD to sell. Some of these CD's are a rare bargain. Good cheer and chutzpa are a part of street entertainment and pay back significantly more than the reticent vibe. In other words good street entertainers enjoy themselves. Not all street artists do music - some paint themselves, draw people, dance - the original street entertainers were usually jugglers or had performing animals. He had a beautiful upbringing - so much so that he says, by way of advice, "Always listen to your dad - he knows better than you - even though you think you know best for you"
His schooling in Africa - modeled on brit small public school, was very tough with bullying and being the brunt of it... nonetheless he had a great relationship with his parents who backed him to pursue a musical career. He went off to study engineering and recording. Bovan formed a band, got a deal and a following and got caught up in the drug culture that brought many an artisst to their knees. He gestured almost despairingly as he said how 'fed up' he got - so he gave that all up and returned to Africa. By this time he was ill with liver cancer and hepatitis C and he ended back in London. He had to go through the chemo and all that sort of stuff from the street because his addiction hounded him. He said that he was given good care and kindness by the cancer people but bwing that sick, handling an addiction drive and sleeping rough did not help. It took him five years to recover with the help of the Big Issue. He wryly remarked that this had got him 20 points. He hopes 'Housing' are going to offer him a hostel room. 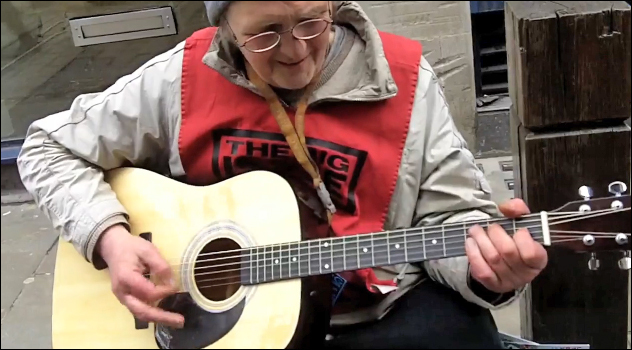 The Leap Anywhere Homeless helpers bought him a guitar and the video is shot as he plays a guitar for the first time in fifteen years. As the few minutes of the video play it's fascinating to see how quickly it all comes back to him. Where to from here? "Well Summer is coming up and we'll see how it goes.. "
That was a kindly thing for Jack Wilson to do. Bovan's spirit rose visibly. The guitar warmed something that felt like a beating heart. You can follow Jack on havefundogood on twitter.